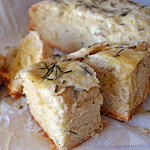 This Rosemary Olive Oil Crock Pot Bread has the same flavors as the Macaroni Grill favorite, but is made in the Crock Pot so you don’t have to heat up the whole house. Best of all, it’s extremely easy to make, and you don’t even need a stand mixer! In a large bowl, mix together the water, yeast, and sugar. Let sit 10 minutes. The mixture should become bubbly. Stir in half of the salt (1/2 teaspoon), half of the rosemary (2 tablespoons), the 3 tablespoons of extra virgin olive oil, and all of the flour. Mix until fully combined. Work it together with your hands, if necessary. Lightly grease a large bowl and place the dough in. Cover it with a kitchen towel and leave the dough in a warm, draft-free area. Let it sit and rise for 1 hour. Remove the dough from the bowl and gently roll it into a ball on a floured surface. Let it sit for another 20 minutes. Set the crock pot to high. Line the crock pot with two pieces of parchment paper, leaving at least 2 inches hanging out of each side of the crock pot. Place the dough in the crock pot and sprinkle it with the remaining salt and rosemary. Drape paper towels over the top of the crock pot and then place the lid on. This should capture any moisture that would sit on the lid and prevent it from dripping back onto your bread. Cook the bread for 2 hours, and remove from the crock pot. It will most likely still be a bit pale on the outside. It tastes great this way, but I like to put mine on a baking sheet lined with parchment paper and put it under the broiler for a quick 3 – 5 minutes to get a crunchier, darker crust. Let cool before slicing. Serve with extra olive oil drizzled on top. To line the crock pot with parchment paper, tear off a long piece and place it in the crock pot in a U-shape, and then take another piece and do the same perpendicular to the first piece, so four sides come to the top of the crock pot in different directions and the majority of the inside of the pot is covered with parchment paper.